Service Learning is more than volunteering. It connects the knowledge and skills one develops in the classroom with practical application in our community. It pushes students to engage professionals in the city, listen to residents, and collaborate on projects that improve life in the City of High Point for everyone. 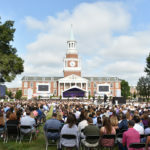 High Point University offers about 25 service learning courses each year, engaging about 500 students in service projects that align with the learning outcomes of their classes. All students commit to a minimum of 25 hours of service during the semester. About half of these courses fulfill requirements in the university’s general education curriculum, and the other half fulfill requirements within specific majors. Dr. Blosser teaches PHL 2043 Business Ethics, which fulfills the university’s general education requirement in ethics. This course is much more than memorizing ethical theories. It requires students to learn ethical theories, but then put them into practice, critique, and questions them as they investigate the ethical issues young professionals in HIgh Point encounter. In collaboration with the High Point Chamber of Commerce, Dr. Blosser’s course conducts a community-based research project. It asks young professionals about the ethical issues they face on the job and how they solve them. These examples give the HPU students real-life case studies to analyze in the classroom, instead of using textbook examples. And the students produce a white paper to help the Chamber better understand how it can work to attract and retain young professionals in the city, which is one of their primary strategic objectives. Young professionals want an active, walkable, entertainment district, preferably in the downtown area. Young professionals believe the city needs a more diverse business community with a wider range of industries that will higher college graduates. The young professionals who already live in the City of High Point like living here, and they point to its small-town feel, geography, and weather as key reasons why they want to stay here. 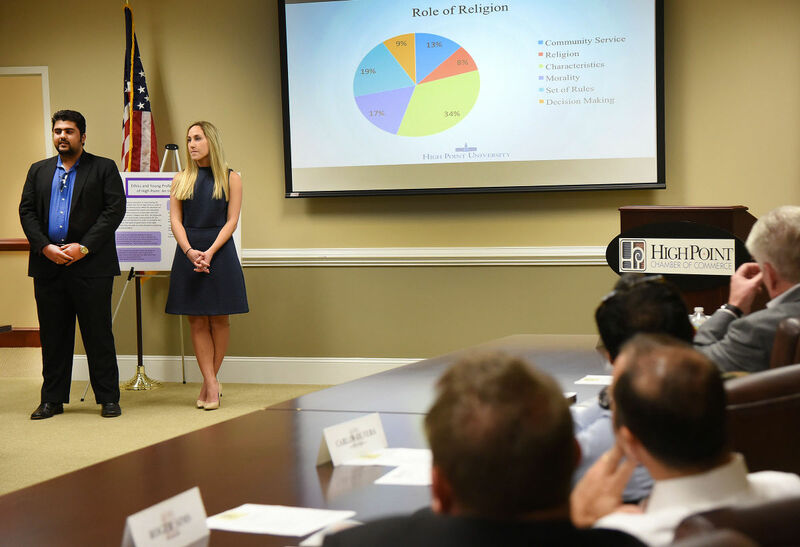 Young professionals in High Point demonstrate high rates of religious attendance, making them quite different from their peers nationally. The class does research on behalf of local non-profits. In the past they have worked with the High Point Arts Council. The class partners with the Campus Civitan Group and Open Door Ministries. The students volunteer as they learn about the economic advantages of a robust civic sector in the economy. The class collects oral histories from some of the last graduates of William Penn High School, which closed in the late 1960s. The oral histories are being added to an online archive and will be showcased in partnership with the High Point Museum. 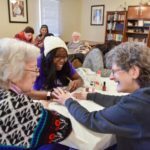 The class does interior design work for local non-profits, like the YWCA, the HPU Community Writing Center, and this semester they are working with West End Ministries, helping them create a more usable space for their ministries. The class requires that students choose a local campaign or advocacy group and work for that organization throughout the mid-term elections.